Upland City Council and the Fairplex have confirmed they have cancelled elephant rides at the Upland Lemon Festival this year. Animal Defenders International (ADI) contacted Upland City Council and the Fairplex last year after discovering they had contracted Have Trunk Will Travel (HTWT) to provide elephant rides at the Upland Lemon Festival. ADI, joined by several local animal activists, presented festival organizers ADI's undercover footage of HTWT owners and trainers "hooking" their elephants with bullhooks, beating and shocking them during routine training sessions. Several other SoCal municipalities and venues have severed ties with Have Trunk Will Travel amidst protests and public outcry, including the Orange County Fair, Los Angeles County Fair, Santa Ana Zoo, and the cities of Fountain Valley and Sierra Madre. "ADI applauds Upland City Council and The Fairplex for ending the elephant rides at the Upland Lemon Festival, joining the worldwide trend of progressive fairs, cities and nations which have decided to shun entertainment that involves animal cruelty," said Jan Creamer, ADI's president. "Trainers use brutal methods, bullhooks and electric shocking devices, to control these elephants for rides, and this decision will go far to set a positive example to other events across the country which we hope will soon follow their lead. ADI will be actively encouraging festival organizers to make this a permanent policy so we never see elephants at the Upland Lemon Festival again." 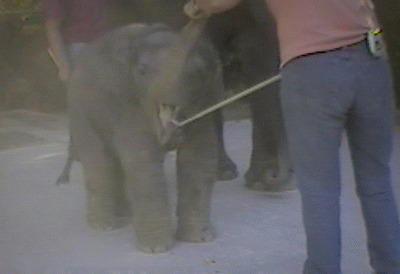 To watch ADI's undercover footage of Have Trunk Will Travel, visit http://www.ad-international.org/animals_in_entertainment/go.php?id=2852&ssi=11 .